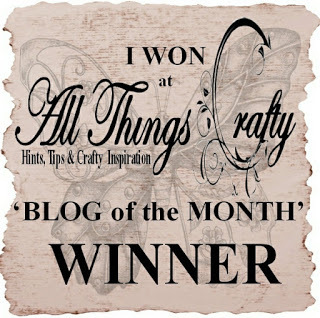 Today we see the start of a new challenge on the “Dragons Lair Designs Challenge Blog” – and I’m now shareing the inspiration piece I created on this month’s theme. For May the theme is “Women at Work”. Any make with a woman involved at crafts or any of the thousands of jobs women do! 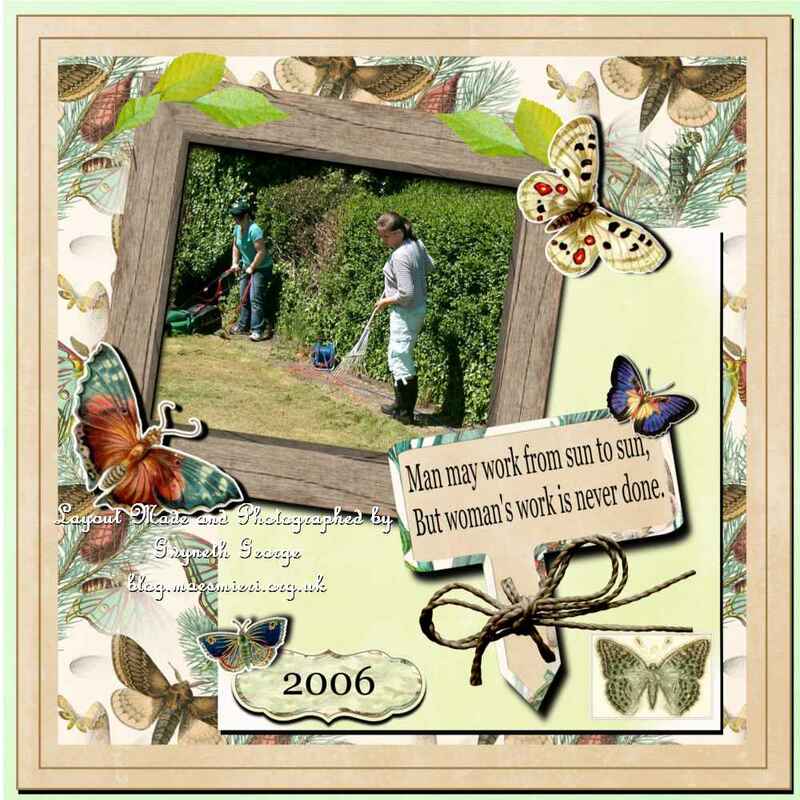 It has been several months since I made a digital scrapbook layout as my design team inspiration for a DLD Challenge, so I thought that I’d have a flick through my digital album of photos and see what I found showing any women in my family at work. Funnily enough there were not a lot of them, but I did find this photo showing two of them hard at work in a garden. And as soon as I spotted it I knew that the new “Butterfly Garden” collection that went live in the Dragons Lair Designs online store on the 1st of this month would be perfect to go with it. Then I went and searched online for the rhyming couplet I half remembered about women’s work. Hope you like what I’ve come up with. 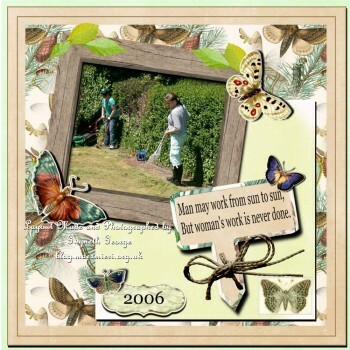 “Butterfly Garden” – there’s still a discount in the DLD online store for this until 14th. I took my photo, together with lots of the items from within the Buterfly Garden collection into the My Craft Studio Elite software and resized, repositioned, turned around, etc., until I was happy with the layout. I added the date to one of the panels from the kit and the couplet I’d found that I thought was apt to one of the elements of the kit that looks like a plant marker. After I was satisfied with my creation I saved it as both a mcs file and a .jpg file. I took the .jpg file into IrfanView for doing the final re-sizing and watermarking (I use it for my photos so easier for me to do the watermarking in this software than My Craft Studio as it is already set up in IrfanView). 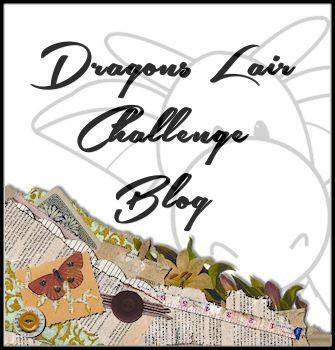 I hope you like my layout and that you will join us in the Dragons Lair Designs Challenge Blog this month. Crafting, House Work, Reading Bedtime Story, Mending Clothes, Tending To Damaged Knees, Gardening, Teaching, Nursing, Doctor, Secretary, Florist, Seamstress, Business Owner, Painter And Decorator, Preacher, etc., and the list goes on and on – what Women’s Work will you use on your entry. I can’t wait to start visiting your blogs to see. Beautiful page and love the layout. That sentiment is SO TRUE!! 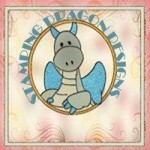 Great make for Dragons Lair Designs Challenges! Beautiful page, love your background paper, plant label and butterflies, they really show the photos off.